As part of the Georgia Manufacturing Alliance plant tour series, leaders in Georgia’s manufacturing community recently participated in a tour of Southwire in Carrollton. As part of the Georgia Manufacturing Alliance, leaders in Georgia’s manufacturing community recently participated in a tour of Southwire in Carrollton. 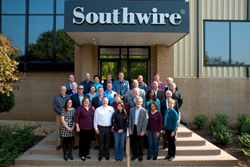 On November 14, a group of 30 industry professionals toured Southwire’s Utility Products Plant, the company’s oldest and largest manufacturing facility. The tour was coordinated by the Georgia Manufacturing Alliance (GMA) as part of an ongoing plant tour series. The visit began with a presentation of Southwire’s history and a company overview shared by Jason Pollard, Southwire’s senior director of Corporate Communication. “I believe that learning about the history of an organization helps our members have a better appreciation of the facilities we tour,” said Jason Moss, CEO of GMA.